Lighting has become so much more efficient in the last few decades. We have moved from old fashioned incandescent bulbs to CFL and LED bulbs, which can save up to 90% on your lighting costs, but people know less about their dimmer switches. How do they work, and do they actually save you money? 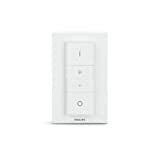 Dimmer switches allow you to alter the amount of light produced from a lightbulb, without the need for installing complex wiring. They mean you can produce mood lighting, which can have a dramatic impact on the look and feel of a room. Different lighting can create a completely different atmosphere without the need to move any furniture around a room or redecorating and all this can be achieved with a simple dimmer switch. Does a dimmer cut your energy use? Dimmers have been around for a very long time, almost as long as the light bulb itself. In the early years, they worked by adding resistance to the circuit, which turned the energy into heat rather than light. This does not reduce the amount of electricity being used, it just changes the amount being turned into light. This has the added problem of the excess heat, which could potentially be quite dangerous! Modern dimmers don’t work that way. 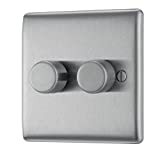 There are several different variations, but effectively modern dimmer switches cut the supply on and off rapidly at hundreds of times per second – something called a TRIAC switch. This reduces the amount of power reaching the bulb, reducing the brightness. This does reduce the overall amount of power being used and therefore you could call them more efficient. Better to dim or not to dim? With LED lights the effect of dimming compared to power use is fairly linear. However, dimming incandescent is actually less efficient than using a lower wattage of bulb. For example, a 60W bulb dimmed to the brightness of a 40W bulb will use more energy than a 40W bulb on maximum. The light will also tend to be ‘warmer’ in colour. Using a dimmer can actually help prolong the life of your bulbs. 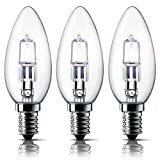 This is because bulbs running at lower power get put under less stress as there is less heat being emitted.This is why some of those famous bulbs you see on the internet that are still running after 100 years tend to be at very low levels – they would have burnt out long ago if they were at maximum output. Dimming is really useful because it lets you alter the light levels subtly, rather than just having ‘on’ and ‘off’. It really adds another dimension to your home’s lighting. So don’t be afraid to get dimmers for your home. They won’t be wasting you energy – in fact they should save you a little and prolong the life of your bulbs. You can’t use dimmers with led or other energy saving bulbs because the bulbs burn out after a few weeks or less.It says so on the package. That’s why it’s important to buy the specially marked dimmer bulbs! And don’t throw that CFL or LED bulb in the trash like an old virtually harmless incanescent. CFL’s and LED’ are toxic waste,.but do you think all users of new bulbs properly dispose of them? Nope. Millions of bulbs need to be discarded each year. How many get proper recycle? We are saving the world energy, but filling the ground and water with toxins. Fix one hole in the dam while another on gets bigger. 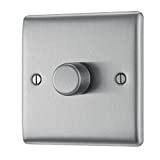 modern dimmer switches cut the supply on and off rapidly at hundreds of times per second – something called a TRIAC switch. This reduces the amount of power reaching the bulb, reducing the brightness. This does reduce the overall amount of power being used and therefore you could call them more efficient. Im confused w the 2 statements. IS author contradicting himself??? Is dimmer more efficient or not???? No, the author is not contradicting himself, you are just a little confused here. If a 60 watt bulb was dimmed to the equivalent brightness of a 40 watt it would use less electricity (making it more efficient that a 60 watt), however, it may actually consume 48 watts. Therefore, dimming the bulb improves the efficiency of the lighting when you don’t want the light at full brightness, however, dimming is not as efficient as simply buying a bulb at specific suggested watt rating. I’ve long used dimmers on halogen lighting as well as regular incandescents on lighting my dining rooms in the (over 30 years) restaurant. I’ve enjoyed the benefits of long life ( as much as 5 times rated life ) and saves time in maintenance and cost to replace. Where I needed about 60 watts of lighting I would purchase 100 watt long life bulbs and many times over a twenty year periods there would be bulbs I never had to replace, especially the halogen bulbs. But there would be “duds” that wouldn’t hold up. I do ponder whether led or CFL’s have the same long life because of the complex circuitry they have inside. Also I do see CFLs and even leds that burn out prematurely. Certainly not the long life they claim nor the same results of dimming I had with halogens and incandescents in the past. I would also like to note that cities use dimmed bulbs for traffic lighting using 130 volt bulbs rather than 120 volt and getting better life. This is my two cents. Thank you. I no long manage the restaurant. Can we have straight bog standard answer as to whether you can save money by using a dimmer or not, I have a room with 12 led low what GU 10’s in them 3watts each they are very bright. I want to dim will it save money YES OR NO ? Hi Anthony! The bottom line is that yes, it will save money, but the amount will be negligible. Hope that helps! Good article, but I have to point out an inacuraccy. The older dimmer switches are not as efficient in energy savings as newer ones, but by the very nature of Ohm’s law they do conserve. Some of the energy is converted to heat – that much is correct. I=E/R. where I is current (amperage), E is voltage and R is resistance. If you increase resistance, you reduce voltage and current. Some losses are present in the form of heat or electrical leakage due to inefficiency of components, but there is still a reduction. Just one thing that is unclear for me then. I would actually agree with the article. Of course the dimmer will lower the voltage on the output but for the cost that the rest of the volts are lost on the resistance. And at this point there are watts (heat) on the resistor since P=I*E. All together the old dimmers were working exactly how the article says. They did not help in savings. ρ(T ) = A (T/ΘR) n ΘR/T f 0r/t n (et − 1)(1 − e−t) dt. But dimmmable LED costs more. Also non-dimable LED and a dimmer can damage the circuit inside quicker than full power consumes the led. Not for long. Soon all LED bulbs will be dimmable with a negligible, if any increase in cost.